This spicy, tangy and delicious pickle-flavored dish was what we had for dinner today and I couldn't wait to blog about it. 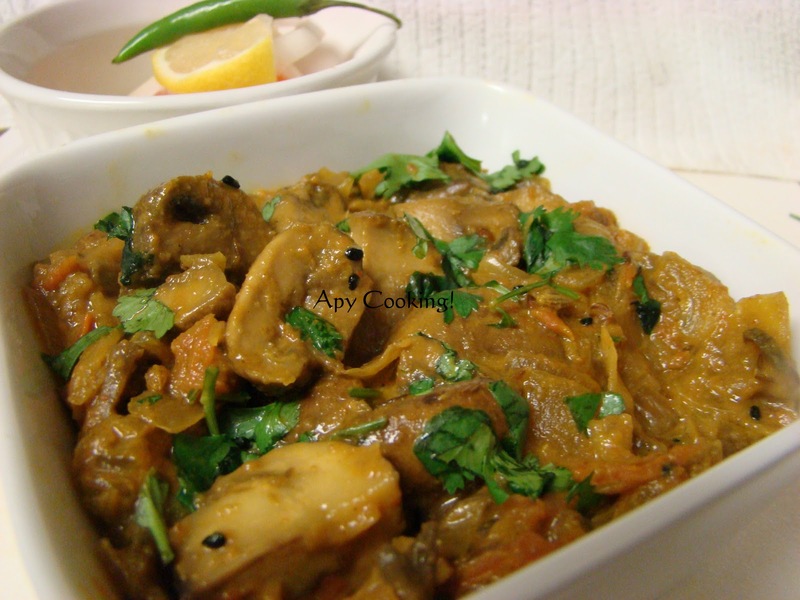 I followed Deeba's Achari Chicken recipe with a few changes, the main change being, of course, using mushroom. For the original recipe, go here. I used baby bella mushrooms for this dish. You can use any regular mushroom. Mushrooms are a good substitute for meat as they pull in the spicy flavors and give a rich and appetizing look to the dish. This was the first time I used Nigella seeds in my cooking. With Priya's and Ayeesha's ongoing event - Cooking with Seeds : Nigella, I was all the more enthusiastic to go ahead with this dish. Soak the green chillies in lemon juice and set aside. Heat oil. Add bay leaves, kalonji, saunf, jeera and methi and roast on low flame. To this add ginger garlic paste and finely chopped onion, increase the heat and saute for a few minutes. Add haldi, red chilli powder and bhuna jeera powder [ dry roast cumin seeds and powder them. I just used regular jeera powder]. Saute for sometime. Add finely chopped tomatoes and roast till they are completely cooked. Pour the yogurt and mix well . [ I usually beat yogurt with a fork or whisk before adding it to any hot dish]. Cook for a couple of minutes. Add chopped mushrooms. Add salt, mix well and cook covered for 8 to 10 minutes, stirring every two minutes. 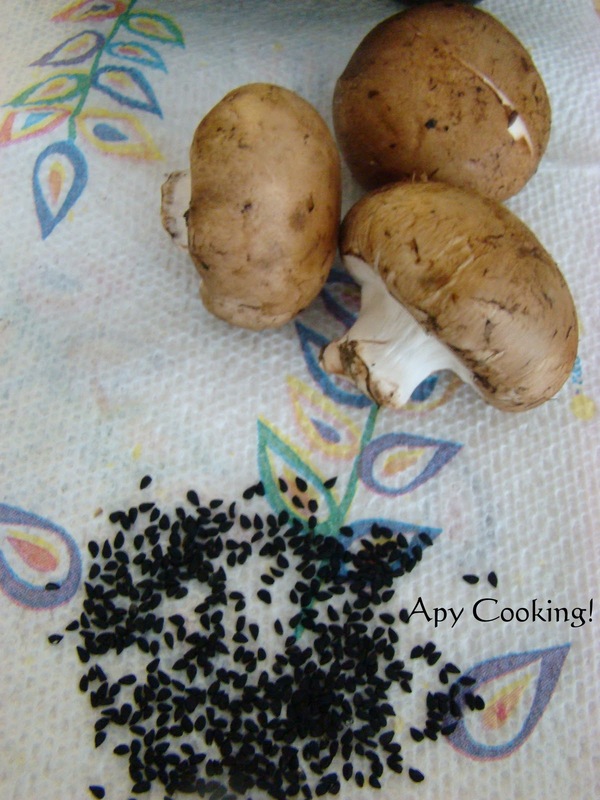 You don't need to add water as the mushrooms along with salt will release a good amount of water. Throw in the green chillies and lemon juice and cook on low heat for two minutes. [ I added only the juice and discarded the chillies]. Sending this to Bookmarked Recipes. This also goes to Tried and Tasted - Passionate about baking, started by Zlamushka and Lakshmi. I love any dish wid pickle flavour..Urs looks too good..This dish will be our this weekend`s special!! Healthy and delicious, great click too..
Hi. Love the achari flavor, goes well with hot parathas. Nice version with the Mushrooms. very interesting n tempting recipe...sounds amazing Aparna.. 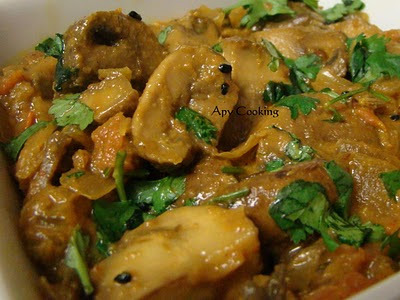 Delicious Achari Mushrooms. I recently tried the Achari Aloo and loved it. I should try the other versions soon !! wow, wonderful looking curry. Thanks for linking it to my event. Delicious achari mushroom..Thanks a lot for linking it to bookmark event! I have never tried something like this, but from what I see I am missing a great deal. It looks very appetizing. Nice and yummy dish with mushrooms...a lovely dish to try..
Heard about achari aloo, but achari mushrooms is new to me, nice preparation. Lovely side dish. Wow, that sounds and looks delicious! I have never had mushrooms prepared like this. 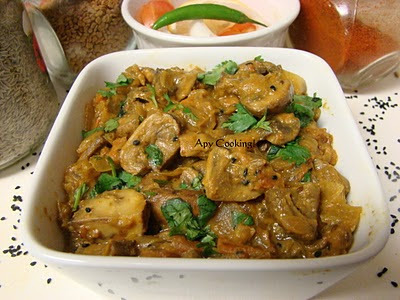 Mushroom curry are my fav...they look tempting and mouthwatering!